The Finnish Meteorological Institute, Vaisala, and partners have launched the 3rd campaign of the Helsinki Testbed project, which utilizes a particularly dense weather observation network for periodic measurement campaigns. The current campaign focuses on the stable boundary layer, and its dynamics in the winter. The campaigns produce data for research on small scale weather phenomena. The 1st campaign of the Helsinki Testbed focused on gathering data for short-term weather forecasts, and the 2nd on different precipitation types. The goal is to gather an extensive research database for the use of the international research community. The January-February campaign investigates the atmospheric layer closest to the ground, particularly the lowest few hundred meters. In winter conditions, this layer is mostly stable, meaning that the air closest to the ground does not mix with air in the upper layers. Typically in these conditions, temperature rises vertically from the ground up. This phenomenon is called temperature inversion. The reasonably cold winter conditions of the measurement area serve the research on weather phenomena in northern latitudes. The moderate and cold temperature inversions close to the ground have a strong effect on the spreading of air impurities and radioactive particles. During inversions, the impurities concentrate close to the ground, thus deteriorating air quality at times. It is the occurrence of these inversions, combined with the possibility to test and validate the accuracy of different weather and diffusion models in stable conditions, that has created international interest toward the project. 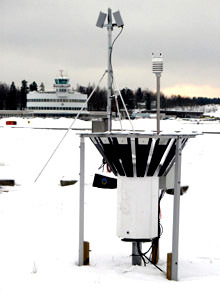 The January-February campaign of the Testbed project enables the versatile measurement and study of the strength, height and development of temperature inversions in the Greater Helsinki area. The campaign focuses on the air layer 300 meters closest to the ground, and produces profiles of the weather parameters in that layer. Temperature and wind are measured with a dense observation network installed on masts. Additionally, a wind profiler, radio acoustic sounding system, laser radars, as well as more-frequent-than-average soundings produce information on temperatures, wind and aerosol occurrence through the troposphere. Some new satellite instruments are also able to detect temperature inversions vertically in the atmosphere.